This is the final day of the 5th Anniversay Giveaway week. I hope you've enjoyed it! My final essay about the first 5 years of Just Hungry is about, well, me. During the course of these years, I've sometimes worried about being too all over the place. I have, as I said earlier, tried to concentrate on Japanese food and cooking more or less. But then I do sometimes go off on a tangent and write about something completely different. After posting something like an in-depth comparison of Marmite, Vegemite and Cenovis, I used to wonder if going off course so much would be bad. I've stopped worrying about that kind of thing now. I've come to realize that the site is born from who I am. I've had a rather complicated, nomadic life so far, and that is reflected in the type of food I'm drawn to. My roots are in Japan, but I also feel that American food, specifically the food in the New York/Long Island area, British food, and Swiss food are 'home cooking' for me too. I know my background is not that typical, so this mix of influences is not going to appeal to a huge audience. But that's OK.
And conversely, I find that I am most drawn to blogs where I can see the person behind it, rather than ones who present some kind of façade that the author thinks will 'sell'. Hopefully, that's a reason for people to stick around and read my words too. So, on to the final giveaway. You actually have a choice of two things! Remember: You need to give me your email address (in the email entry area) where I can contact you if you win, your name (or nickname), and your location (country). In addition, for this giveaway only, you must tell me which lot you want, the Fanny Cradock cookbook or the Japanese cookbooks. Comments/entries that don't indicate this will be eliminated from the draw. 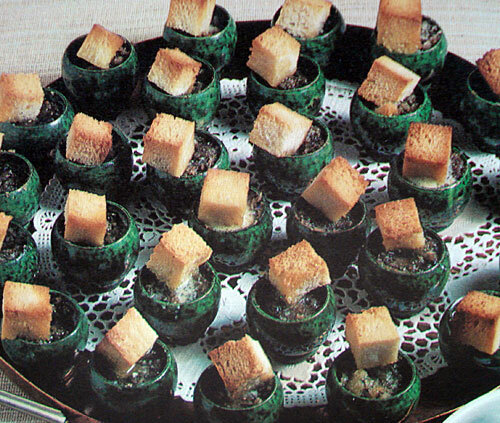 Tiny dark green snail pots filled with mushroom paste and topped with individual deepfried croutons. I mean, the fiddliness! Nothing says elegant table like aqua-green dyed mashed potato piped into swans made of hard boiled eggs and pipe cleaner necks. A raw meat and boiled vegetable table decoration. Words fail me. In all seriousness, the mostly francophile recipes are on the whole not bad; there some OMG moments, but also plenty in there that is actually tasty and not too artery-clogging. The book is in 'used' condition, but is in pretty good condition for its age. It even has all the adverts and reply-postcard inserts and such. If '70s retro food is not your thing, perhaps these two cookbooks are. 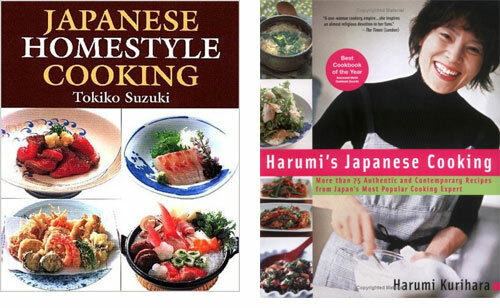 Both translated from Japanese, they are written by two of the most popular cookbook authors in Japan. I've written about Japanese Home Cooking by Tokiko Suzuki previously. She is one of the great teachers and I rely on her Japanese books all the time. Harumi's Japanese Cooking by Harumi Kurihara is a modern take on Japanese home cooking. She's popular enough in Japan to have her own Martha Stewart Living style lifestyle magazine called harum_mi (it's a quarterly). Again, please indicate whether you prefer Fanny Cradock OR the Japanese cookbooks. This, and all the giveaways, are now closed. Thank you for participating! The winners will be announced later this week! Submitted by maki on 2008-12-05 16:33. Hi Maki, I just wanted to thank you for writing these two blogs :) i have learned so many things that i always wanted to about Japanese cooking and bento-making. I hope you continue to write for a long time on these sites as I know I (an many others) eagerly look forward to every new post. I think those Japanese cookbooks would be awesome!!!! Wow. Wow. Wow. Words fail me in the presence of mashed potato swans. Having said that, I'd pick the Japanese cookbooks as well. I've just recently started making bento lunches and your websites have given me so many new and tasty recipes to try! I look forward to each new post. as a new reader, it's been so fun reading about how just hungry has evolved over the last 5 years. i'm in the us and i've been bugging my japanese co-worker about food and cooking so i would love the japanese-english cookbooks! Thank you so much maki! So if you draw my name, I'd prefer the Japanese cookbooks. Thanks for a week of very interesting entries! I missed you while you were on vacation. I have been looking for a Fanny Cradock book. The Japanese books are very tempting but as someone else mentioned, I can buy those. Please enter me for the Cookery Programme. Many thanks. Like you, I also prefer to read blogs which shows us the personality of the writer. Otherwise I might as well read a cookbook/guidebook, right? I also like a mix of different posts in a blog. Actually once I've decided that I like a blogger's writing style and what he/she has to say, I pretty much will read the blog regularly so if, for example, the writer of a food blog decides to post about something other than food I just find it a refreshing change but it won't change my mind about the blog in general. I like the Japanese cookbooks better. I'd prefer the Japanese/English cookbooks. I'm still learning and have a long way to go. From Anchorage AK, only a "short" plane ride to Kyoto ... in my dreams. I hope to go back to Japan one day. I also would love the Japanese cookbooks! I've been thinking of buying a Japanese cookbook for a while now. Thanks for offering. I'm from a similar background as you and have had some of the same experiences so I definitely find your blogs interesting! Thanks so much for them Maki!!! P.S. I'm all about the vintage food decoration! I seem to be in the minority here but the '70s book just draws me in. and I really like Japanese food, so it would be great to have a cookbook for it. I love both choices for completely different reasons. But the Japanese books would be far more used by me than the others. So I'll have to go that way! I don't own any myself - haven't seen many good ones around in English, but these look great! japanese cookbooks in english thats sounds so interesting. id love somehing like that. Mashed potato swans? Looks like a character bento item to me! ;) I've seen the Japanese style home cooking book at the Japanese bookstore and always almost get it... Not sure whether it's cheapness or intimidation that gets the better of me, lol. I have enjoyed reading both of your blogs for at least a year now, and I constantly refer to your various recipes and tips. Thanks for your commitment and consideration to your readers! The giveaway and reflective essays have been fun. Such a tough decision, and a great way to end your anniversary week! I do love Fanny, though! That would be my choice! Ooh, I've had my eye on those cookbooks for a while (the Japanese ones, that is). Thanks for doing this giveaway! Oh I'd love the Japanese books. I have been slowing trying to obtain Japanese cookbooks and try my hand at them. I'd love the Japanese cookbooks 0 the Homestyle Cooking one is actually on my wish list already, probably due to your recommendation! the retro is tempting, but the japanese books would get a lot of use in my household (and it my choice). Again, thanks for the contest. I enjoy the eclectic mix of topics on your site, so I'm glad you've not felt the need to hew strictly to Japanese cuisine. those lemon pigs are hilarious, but given the choice id take the two japanese books. one of those has been on my amazon wishlist for who knows how long. congrats again on the anniversary, i love both your blogs! The Japanese cookbooks look fantastic. I'd love a chance to win those. What interesting looking books! And I've loved the essays you've posted this week. I also have an eclectic background and think you made a good choice in including it all. I'd pick the Japanese cookbooks! Wow, troughs of poo or easy Japanese recipes? This is a harder decision than it seems. I was pretty sure I wanted the Fanny Cradock book, but those Japanese cookbooks look too good and will be more useful. Sign me up for the Japanese books! I've really enjoyed this week. Thanks for revealing so much about your blog history and yourself. I do prefer to read blogs that reflect the true personality of the author. 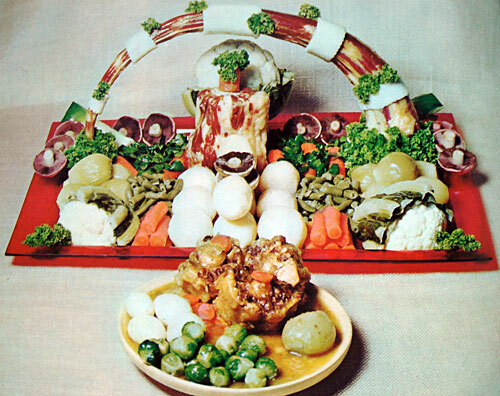 That 70s cookbook looks hysterical! I'm in for that one. Yum, nothing like blue food coloring and pipe cleaners to make me appreciate my wholesome, whole-food lunch! As fab as those picture are, I think I'd have more fun with the Japanese cookbooks! Well, what a tough choice. Well, what a tough choice. That 70s book looks hilarious - what were they thinking?! You know as soon as you think of putting pipe cleaners in food for decoration, you have gone too far (let alone considering raw meat an appropriate table decoration). What other delights does this book hold? On the other hand, the two Japanese books look like something I could actually use...so they would be my pick. Congrats on your blog-anniversary and thanks for the giveaways! I think the 70's one looks way to fiddly for me, and i don't have any Japanese cookbooks, so those would be nice if i win :). I'm off to go thru your archives some more! And your blog is wonderful because your personality shows thru. I like that your blog has personality. That part of what makes it fun to read! I'd like the Japanese cookbooks if I win. I have truly enjoyed your essays this week, and have become a Just Hungry reader because of them. Thank you! This is a great site for basic techniques. I made homemade tofu based on the recipe here, and it was great. A lot of effort, but worth it in my opinion. Also, I suspect that repeated attempts will go more smoothly. And I think my appreciation of that process, and it's somewhat plain, but delicious result, is related to my preference between the cookbooks. As much as I like to look back on retro recipes for amusement, I'd rather have a cookbook with recipes I actually wanted to cook. Which is to say, sign me up for the Japanese cookbooks. Can't have too many cook books. Thank you for five days of interesting posts. I have a pretty good idea of some of the challenges that bloggers face. Thank you for your honesty. This has been such an exciting week for your twin blogs. These week-long giveaways were amazing! I continue to enjoy your tapestry of recipes, musings and reflections and I hope to continue to do so in the future. Here's to another 5 years of ruminations. PS - the Japanese cookbooks would make a wonderful addition to my (Japanese) husband's collection. Having inherited my fair share of stellar 70s cookbooks, I'm much more interested in the Japanese ones. Thanks--again--for being out there in the blogosphere! I would have to go with the Japanese cookbooks! Fanny Craddock is the shizzzz! I would love the Japanese food books - I've never really learned to make the traditional foods my mom and grandmothers used to make. I would say that you haven't done anything terrible just yet, really. I found the Vegemite, Marmite, and Cenovis entry fascinating. Intriguing though the retro books are, I've had my eye on that Harumi cookbook for a long time! I'd love the Japanese cookbooks - I recently moved from a big multicultural city to a small one that is very much less diverse. I miss the Japanese restaurants I frequented back home, so I'd use these fairly often. country = USA but I'm a kamaaina and island bound. Hee, the Fanny book looks hysterical... please put me down for that. From the USA. usa - pls enter me for japanese cook books, thanks! I really like how you put a bit of yourself in your blog - keep it up! Congratulations from Evanston, Illinois (USA)! I have loved your blog ever since I stumbled upon it a couple years ago. Keep doing that thing you do (i.e. being yourself). While I love the retro pics on the 70s-era cookbook, I definitely have to go with the Japanese cookbooks. Again, congrats on five fab years of Just Hungry, Maki! Choice #2, of course - I come here to read about Japanese stuff! Great blog with lots of practical advice as well as humor. I am so glad I stumbled upon it. The Japanese cookbooks would really come in handy. Thank you for a fun week of reading your site. It's great to think that we've come along way from the food habits of the 70s! Hi Maki! I'm not here for the prizes actually - but I do love both Just Hungry and Just Bento and have been a quiet reader (ok, lurker) for some time. I just wanted to say I can totally relate to your mix of influences, being myself of Korean descent, born and raised in Brazil (!) and currently living in the Netherlands. I just love kimchi, feijoada and stampot equally, and that's what makes me ME. Keep up being you and writing whatever you feel like, because that's what we love. What a wonderful way to end your giveaway. I love your wonderful website. Thank you for all of your hard work and commitment. My choice would be the Japanese cookbooks. Congrats on your anniversary Maki. I also prefer blogs where I feel there is a real personality involved rather than a market-research amalgam. i have seen the Harumi cookbook here in London, and would love to win them. Oh, those Japanese cookbooks look wonderful! They're my choice should I be so lucky! I love reading both of your blogs! Hello! I love this idea and I'm really interested in the Japanese Cookbooks. I had to live through macrame, leisure suits, polyester pants suits, and the Captain and Tennille. The Fanny Cradock book is mine by divine right! Happy fifth anniversary! If I'm chosen, I'd prefer the Japanese cookbooks. fanny cradock, please. it's too funny to pass up. the fanny cradock book is too funny. 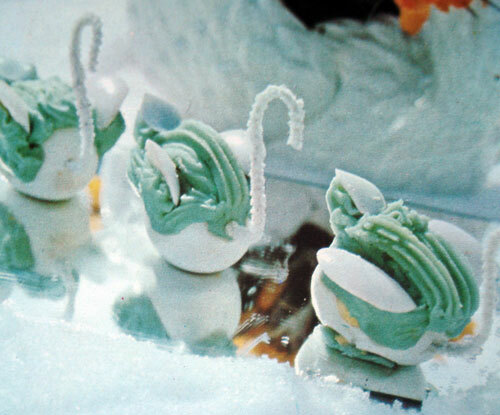 is the chicken on the left sitting on a mound of green mashed potatoes or a mint-frosted cake? i'd like that one, please. Woah! I am scared of Fanny Cradock for a lot of reasons, which means it's definetly the Japanese cookbooks for me! Ann in Canada. I enjoy reading your blog and take inspiration from your writtings to use in my cooking and life. Thankyou for sharing this part of you with us. I am laughing and cringing at the idea of a raw meat and boiled vege table decoration. There is a butcher that gets on my train home in the afternoon and the smell of meat on him makes me feel ill and I eat meat. I just couldnt imagine sitting at a table decorated with raw meat..
i would like to know what the martha stewart of Japan is like, so the Japanese cookbooks would be highly valued over my way. Also, the photos on the cover (from what i can see) look tasty! The Cradock Cookbook if it's from the 70's would make it older than me - I, for one, am glad cooking has moved on from lemon pigs and raw meat decorations! Hi, I'm from Singapore. Found your website when I was searching for the meaning of 'konbu'. Such a fabulous website with details of the ingredients and lot and lots of Japanese recipes. Thanks! Hi, I'd definitely pick the Japanese cookbooks if I won this contest. I have a few of those older cookbooks I've inherited, or stupidly bought at 2nd hand stores. Sorry, but they're kinda icky. But the first pictured Japanese cookbook, the bottom 2 photos, yuuuuum! I've enjoyed reading your anniversary posts. Happy 5th anniversary! Congratulations! I know that another great year of Just Hungry goodness is just around the corner. Those pigs are just too much! Very cute. I would be very interested in the Japanese cookbooks in English. Thanks for putting this together. 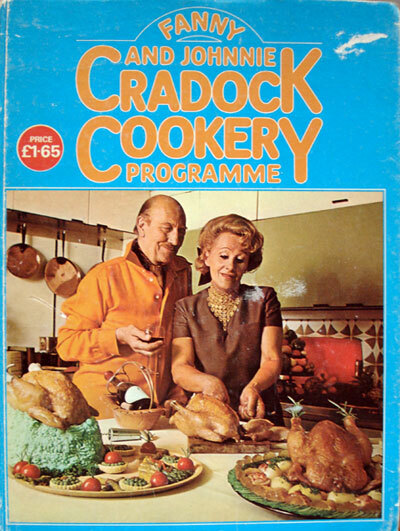 I would choose Fanny Cradock because I want to learn how to decorate with raw meats. Oh yeah, stylish AND practical. I like the Japanese cookbooks. Thanks for the week of give-aways and memories! You're site is one of my favorite sites for japanese recipes ever. The Japanese cookbook if I should be so lucky and your site is really a good one. Thank You, Steve H.
I love your site, I visit this site a lot for cooking ideas but have never commented before. Hi again Maki, thanks for all you do. would love to receive the japanese cookbooks. I just found a great fishmongers the other day that carry sushi-grade tuna. i bought a chunk of chu-toro, made my own sushi - it was delicious! really looking forward to improving my japanese cooking skills..
Hi Maki! I totally understand what you mean about having a diverse background. I also grew up in various parts of the world so sometimes I feel like I don't really "belong" in just any one group. But your blog should reflect who you are...I think in the end, people will appreciate that more. Wow. I would like to have these, especially. As for your "who am I" intro, we love you as you are -- and your websites attract and hold us. No worries!!!! Wow. Those 70s pictures are a bit scary. Although I'm sure it'd be good for a laugh, I'd have to go with the Japanese books instead. Ooh, I would love the Japanese cookbooks! Those pigs are adorable. I've been trying to eat more Japanese food lately, so your sites have really helped! They look lovely, as do all your giveaways! Yay your site is awesome. I think I've said this before though. And I prefer the Japanese ones. Although the vintage book looks kind of cool... haha. 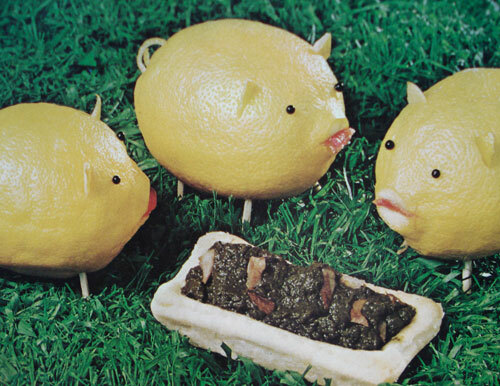 Lemon pigs. Just wanted to thank you for these wonderful blogs that you do. I've made many things from them, easily and quickly, thanks to you, Maki. I'd like to get my hands on the Japanese cookbooks! I would love those Japanese cookbooks in English. I daydream about the food I ate in Japan all the time, so I'd love to be able to make some at home. Actually, your interesting mix of cooking influences (esp Japan) is what drew me to your blog to begin with and it is definitely what keeps me coming back. Japanese cookbooks... mmm, Japanese food. Seeing as how my mom still cooks like it's 1973, I'd choose the two Japanese cookbooks, if only for the change of pace! If picked, I'd like the Japanese cookbooks. Congratulations on your 5th year. The Japanese cookbooks look great. Looking forward to your future writing and recipes. it's so much fun reading your blog. i would like the two japanese cook books if i am chosen please! Although the first book looks really interesting, I'd love the Japanese books. I've got another of Harumi's books out of the library at the moment and it's really good. I love your blogs, please keep up the good work. I would love to have the japanese cookbooks. Ooh what a difficult choice! Ooh what a difficult choice! I think I will go with the Japanese cookery books, as I might bump into a copy of the Fanny Craddock book in a charity shop here in the Uk. Thanks! That retro cookbook left me speechless. But I really want the Japanese cookbooks. I would definitely love to get the Japanese cookbooks if I were picked. I love how aesthetic, delicious and healthy Japanese food is! Just wanted to express my gratitude for all that you've done for me. Your blog has brought me back to a time when cooking was enjoyable and peaceful and not a chore, especially when cooking for seven people. We've lost another family member this year to cancer and it was your blog, recipes, and fans comments that had gotten me through some rough times. This past decade I have been caring for grandparents while trying to raise my own kids. It is too easy to just drown your sorrows in food. I found that preparing the bento boxes and imagining the faces of my children at lunchtime brings me such joy and peace. Having been overseas this past decade and trying to find proper ingredients has been difficult. Now that I am back in the U.S. I look forward to passing these great recipes and skills to my own kids. When each child moved out, we were given a rice cooker, wok and some wise words. I hope to pass this along with the Japanese cookbooks to my eldest soon. Akane and Family, Virginia, U.S.A. I like those Japanese books! I think my grandmother had one very similar to the other though. I've really enjoyed reading about you and the history of your blog! Thanks for sharing with us. I think everyone was stoned during the 70s! I'd pick the two Japanese books... Thanks! Definitely would go for the japanese cookbooks. Let the anniversary party continue!! Having said that, I'm really here for the giveaway, and I would like choice number 2!!! Japanese Cookbooks in English! Thanks! The Cradock book looks interesting but the Japanese ones would be more useful to me. I agree.. a big staying factor for a lot of people is when they feel they can relate with the author of the blog site. The Japanese cookbooks would be my choice. Happy anniversary! I just wanted to say thank you for sharing all these fantastic recipes and such with the rest of us! Ever since I came back from my trip to Japan, I've been getting random cravings for food that I had eaten there... <(^_^); Normally, I'm more of a baker but I've tried the Omurice and Hayashi Beef Rice recipes that you have provided. Looking forward to trying more of the shared recipes, too. The list of where you can get Japanese goods is so helpful too. Happy 5th Anniversary once again. [If chosen, I would like the two Japanese Cookbooks, please] Cheers! I'm a recent reader to your blog and have been really enjoying it. If I'm picked, I'd like the Japanese cookbooks. Thanks for the fun giveaways! LOL...love the retro food! But I need all the Japanese cooking help I can get so would prefer those. I would love to have the Japanese cookbooks! I'd choose the Japanese books. Congratulations on the anniversaries of my two favorite blogs! Having really gotten interested in bento making almost a year ago, I found Just Bento right after it started up. It's been such fun to let you guide me to all sorts of what are now my bento favorites, with happy excursions to Just Hungry when I wanted something for dinner, or just to read all the interesting articles you've written over the years. Thank you again from a happy reader, and many more years to come! P.S. If I am so lucky as to win, I'd prefer the Japanese books, please. Wow, those books look GREAT! Thank so so much (again) for your wonderful sites. I just can't imagine the past couple years without JustHungry, and yes, I always came back, not just for the food, but for those tangents that showed your personality. I've really enjoyed your work, so much, and I hope it continues for a really long time. Thank you Maki! PS. I would really love the Japanese-English books. A Japanese friend has lent me a couple issues of Harum_mi, and I've fallen in love with Harumi, and would love her cookbook! This blogiversary has featured so many wonderful musings! Thank you for sharing them with us. Fannie and Johnny for me please! I would love the Japanese cookbooks! I rented the Harumi cookbook from the library and thought that it was awesome. The vintage cookbook is a bit much for me - aqua dyed mashed potatoes?!?! I would love to have the Japanese cookbooks! I have been on a Japanese food obsession since September, partly fueled by your fabulous blog. Keep up the good work! Ooh! This is so exiting! I, also, was always the girl who was left out at my school, so I can understand very well how bad it felt. I have also had issues with my weight because of it; that is why I decided to try out bento this year, and I love it! 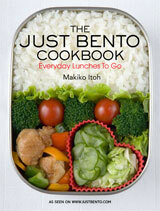 Thank you for making such an exellent blog for us who love bento! Those Japanese cookbooks translated into English are a god-send! Hi ! Maki ! !What super Japanese cookbooks! I'd love to win them..I need all the help you can spare..LOL !! those Japanese cookbooks look great! I'm going for the 70s style cookbook. It'll be hilarious trying out the recipes. Thanks for the giveaway opportunities, Maki! I've been reading you for years. I love Harumi, so I'd pick the Japanese cookbooks. The Craddock Cookery book looks very special, but the Japanese books are more up my alley - which is why I read this blog. I'd love to enter the draw for the Japanese books. But most importantly, keep posting! And thanks for 5 years! I also like blogs where you get a feeling of the person behind it. Thanks for Just Hungry! Those lemon pigs are hilarious! Old cookbooks are hilarious to read now. They sure were creative! What a great giveaway! Congrats on your blog's success. Please, I'd like the Japanese cookbooks. In my family, I'm the only one who introduces and cooks Japanese food. Those books would be very helpful. Hehez.. thanks for the giveaways, love japanese food.. cookbooks in japanese will also help with my japanese study! Thanks! I'd LOVE those Japanese cookbooks! Congrats on 5 years! The giveaway you are hosting is a great act of generosity, whoever wins. Thank you for hosting it :). Sorry, if I got picked, I would choose the two Japanese books. Oh I'd love the Japanese cookbooks! I been looking for yummy Japanese recipes! I'd pick the Japanese cookbooks - they would be amazing. I'm actually in Japan right now (originally I'm from the UK), but so far my collection of Japanese recipes consists mainly of stuff copied off this site - be great to have some stuff of my own! Would love the Japanese cooking ones. And about the books... even though I deeply impressed by the lemon pigs and the egg swans.... I'd rather go for the Japanese cookbooks (and browse my Mum's bookself once I'm back at my parents', she might still have some of her old cookbooks). I'd love to have a shot at winning the Japanese books, thankyouplease! I'd love the Japanese cookbooks! congratulations, again, on the anniversary! these giveaways are so fun and generous of you. i've been eyeing both of those japanese cookbooks for quite some time - fingers crossed! I'm interested in the Japanese cookbooks giveaway! Thanks! I feel just like you. I'm French, but I spent several years in the US and both types of cooking feel like home-cooking. And I just love japanese cooking! I've spotted Harumi's book and I've been considering buying it, so I would be very interested in winning it! Your blog is one of my go-to websites for Japanese cooking. Hurray, food cravings satisfied! I have numerous post-its of your recipes on my kitchen wall. Write on, maki! I would choose choice no. 2: Two Japanese cookbooks in English. Thanks! Hi! Congratulations on the anniversary of the site. I really enjoy reading and cooking from it. I hope I win the Japanese cookbooks! The Japanese books. I have a baby on the way - no time for food sculptures! The Japanese cookbooks look great!! even if i'm not the lucky recipient of the Japanese cookbooks (though the 70s one is awesome for the photos alone), thanks for mentioning them here -- i will need to go check them out! i've heard of Harumi-san before, but didn't know she had anything out in English. happy anniversary, and thanks for a fun celebration week! I was in the middle of my Sunday cook-a-thon and I came up with 3/4 of a can of kidney beans that I still needed to use up. I googled kidney beans and came across your Curried kidney beans and vegetables. Delicious! I read through a number of your posts and recipes and I am excited to see more. Congratulations on your wonderful blogs! Although both choices are good, I would prefer the Japanese cookbooks, please! Those Japanese books look great! Happy 5th! I remember a few really interesting 70s dishes at my mom&dad's parties in the 70s - hilarious! Thanks for sharing those. I'm Alyson in the US and I'm more interested in the Japanese books. Happy Anniversary - thanks for sharing with your readers! I'd love to win the two Japanese cookbooks! I've gotten the Harumi Kurihara one from the library and loved it! I'd love to own it along with the other one!